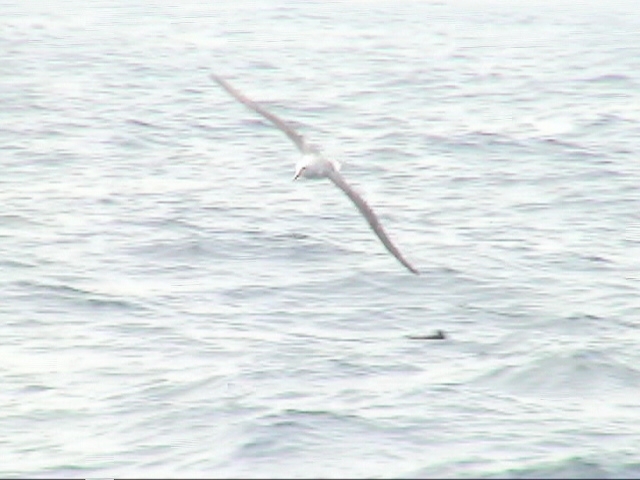 Possibly a White-capped Albatross on July 10, 2003. This and all the other photos of the supposed White-capped Albatross have later been identified as a very pale-headed Salvin´s Albatross. Included here is the discussion by Alvaro Jaramillo, Peter Milburn, Tony Pym and Ross Sllcock. Also thanks to Karen Baird of KIWI WILDLIFE TOURS NZ, Tony Wilson of Manu Tours NZ and Graeme Taylor NZ for additional comments on the pictures. See picture nr. 2 for full comments. 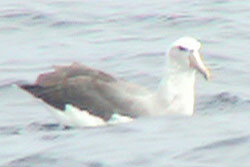 White-capped Albatross Diomeda cauta cauta on July 10, 2003 33 nmiles off Callao. Salvin´s Albatross # 2, July 10, 2003. Photo: Gunnar Engblom. This and all the consequent photos of the supposed White-capped Albatross have later been identified as a very pale-headed Salvin´s Albatross. Included here is the discussion by Alvaro Jaramillo, Peter Milburn, Tony Pym, Ross Sllcock and Hadoram Shirihai. Also thanks to Karen Baird of KIWI WILDLIFE TOURS NZ, Tony Wilson of Manu Tours NZ and Graeme Taylor NZ for additional comments on the pictures. I´m rather late in this debate. We (http://www.sossa-international.org) have a banding program off the coast of NSW and band both Shy and White-capped Albatross. Both Salvin´s and Chatham occur as rarities. As it happens I have a lot of experience of White-capped Albatross having been part of a research expedition to the colonies on Disappointment, Auckland and Adams Islands. 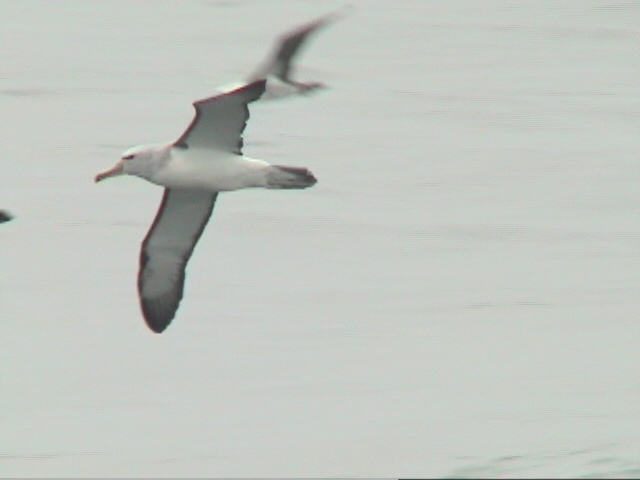 The images I viewed were not the best but from my perspective the bird labelled White-capped Albatross showed all the features of Salvin´s Albatross. In my opinion, White-capped and Salvin´s are distinct at all ages but diagnoses are based on multiple features. 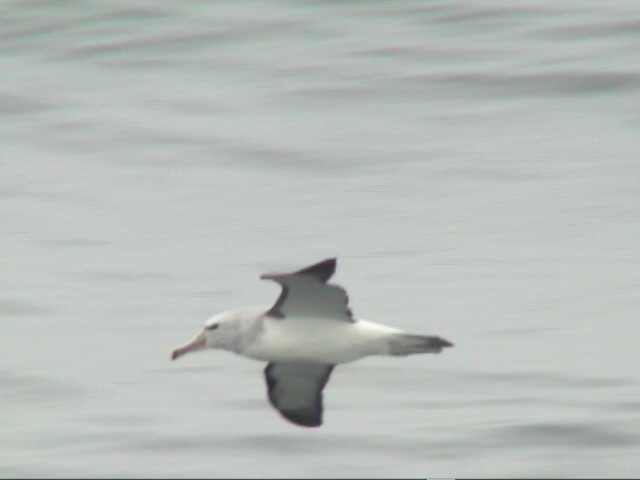 However the best indication from these images of the bird in question is the bill. 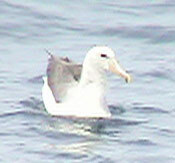 Adult White-capped Albatross have distinctly bluish tinges in the bill, especially along the culmen. The bird in the images has the typical adult Salvin´s bill. The pattern of markings of the head and underwing is also typical although rather pale in the images. Well, interesting. Like all at sea shots it´s a shame its so overexposed. There seems to be good things, like head in one shot and underwing, in favour of Shy/White-capped but there doesn´t seem any contrast to the forecrown (maybe the light). If this is a Shy/White-capped it cannot be adult (with the bill having a dark tip), I believe there is some work, in writing somewhere, on variation in the bills between the forms? This is worth searching. You could contact Hadoram Shirihai who´s working on a new book on the tubenoses. With his normal attention to detail, he knows much more than me. Only trouble is I don´t have an Email address for him! Hadoram Shirihai writes: I tend to think that your bird is Salvin´s (the very pale head is because overexposed images with strong light that "burning" the grey colour), and the bill and underwing seems better for latter (but will like to see better images to confirm all these characters and the head colour). White-capped Albatross # 9 -on water, July 10, 2003. Pelagic from Callao. Photo: Gunnar Engblom.